Getting proof I was here! 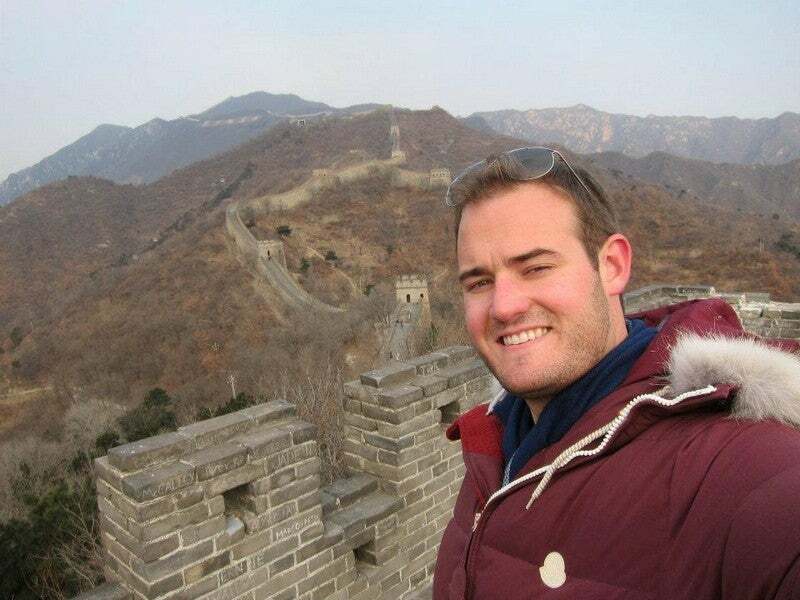 Of course, I couldn’t come to China without seeing one of the world’s most famous landmarks: The Great Wall of China. And, in fact, there are sections of it that are very close to Beijing, which made it easy to spend a day exploring it while I was there. After my two days seeing the sights of the capital, I was under some time constraints since I was flying off to Shanghai on the afternoon of my third day. 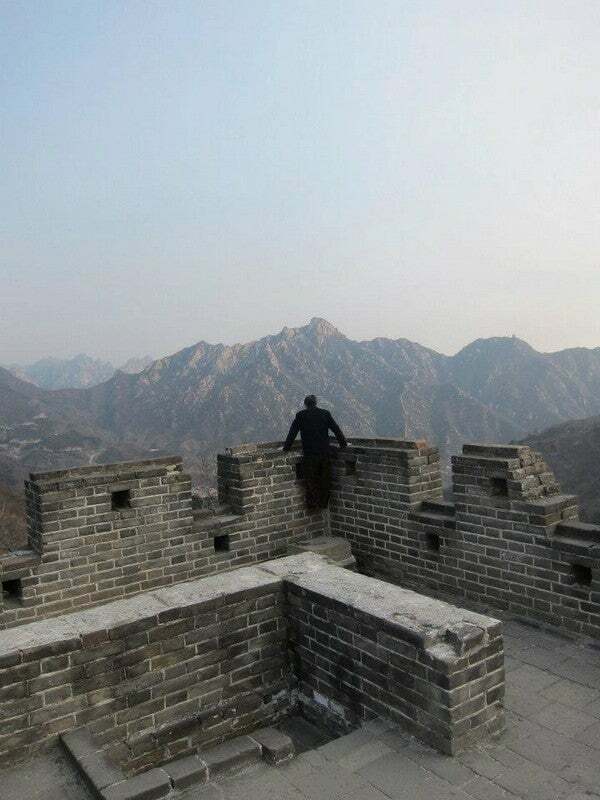 So I had my tour guide, Jenny, pick me up at my hotel at 8:00 am on the third day to take me to a section of the wall near the city called Mutianyu. Looking out from one of the guardhouses. 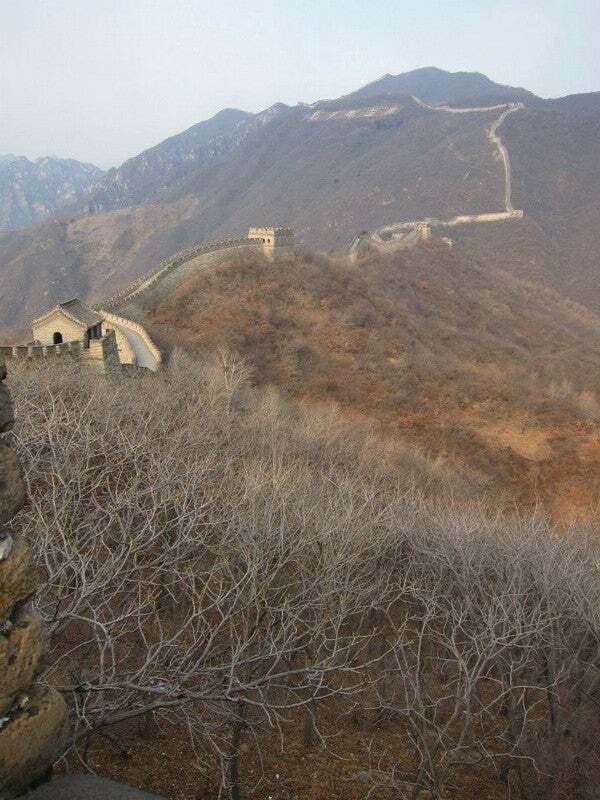 Mutianyu is one of the most touristed sections of the Wall (after Badaling) since it’s just about 40 miles from the Beijing. Since it was off-season, though, and only about 20 degrees out, Jenny assured me it wouldn’t be too crowded, and she was right. 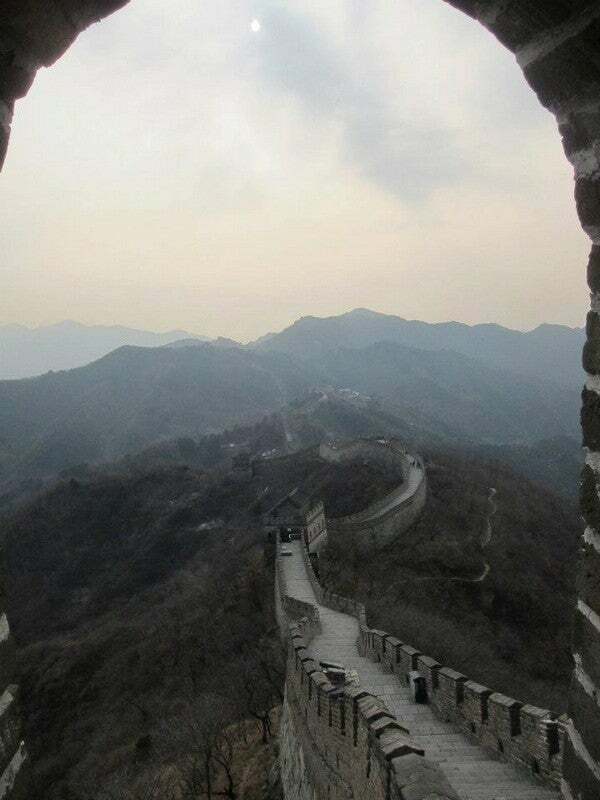 This part of the Wall is definitely the section that looks like what everyone pictures the Great Wall of China to be. It was originally built about 1,500 years ago, but now it’s been restored to what it would have looked like in the 1500’s. It is the longest restored section of the Wall at over 22 km (14 mi.) in length, and been completely reconstructed in stone with 22 fortress-guardhouses rebuilt in the traditional style. It winds along the hilltops and is really picturesque. Admission cost 40 Yuan, or about $6.50, and the cable car to a viewing platform costs 80 Yuan ($13) roundtrip. Putting the structure in perspective, it truly is huge. Jenny knew I was a blogger and that I have an adventurous streak, so before we actually went to the Mutianyu entrance, she suggested dropping me off at a wild part of the Wall and letting me hike to the entrance, which would take me a couple hours along a marked path. I was a little bit nervous about hiking through the Chinese countryside by myself, but it sounded like fun—and it was for a little while, as you’ll see in the video below, but before long I felt pretty lost. Jenny apparently got nervous about me too, because I got a frantic phone call from her about 20 minutes in telling me she was coming to pick me up since locals had told her the path gets pretty rough and difficult. After that, I pretty much took it easy. I went to the little tourist center and took a ski-chair lift up to the wall itself and walked along its length for an hour or so, taking the really steep part up to where I could catch the cable car back down. The scenery was absolutely stunning, and I had large portions of the wall just to myself, so it was a truly awe-inspiring experience. Another shot of the Wall as it winds its way along the hilltops. As I mentioned, it was freezing, so when I got back to the viewing platform where the cable car was, I had a beer to warm up and relax as I took one last look at the fortifications and the wall running along the surrounding hilltops. That’s in my video as well. Once I got back down to the tourist center at the base I was practically assaulted by merchants selling souvenirs, practically screaming at me to buy their wares which I took in stride and actually felt bad for them since they must have been freezing being outside all day! Jenny met me at a small café there at the base and we had some fantastic dumplings for lunch, and I also had the chance to try baiju, a fortified Chinese wine that has more alcohol than vodka (about 56%!) and tastes…well, let’s just say I practically couldn’t feel my tongue for a few minutes after taking a swig of the potent booze. A less touristy part of the Wall I walked along before Jenny told me to come back. 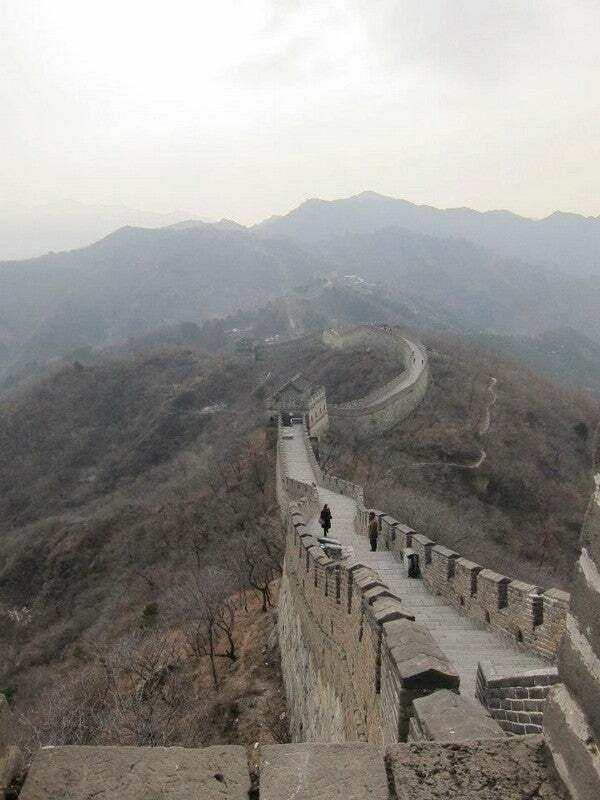 It was a quick expedition to the Wall, but I was just happy to have been able to see it during my trip since it’s one of the wonders of the world, and I had a beautiful but freezing day mostly free of tourists to experience it for myself. Check out more of my photos in the gallery below, and watch the video for a running commentary on my misadventures during my day out at the Great Wall of China. A lonely stretch of the Wall on a freezing winter’s day. Looking along the Wall as it stretches out for miles and miles into the distance.